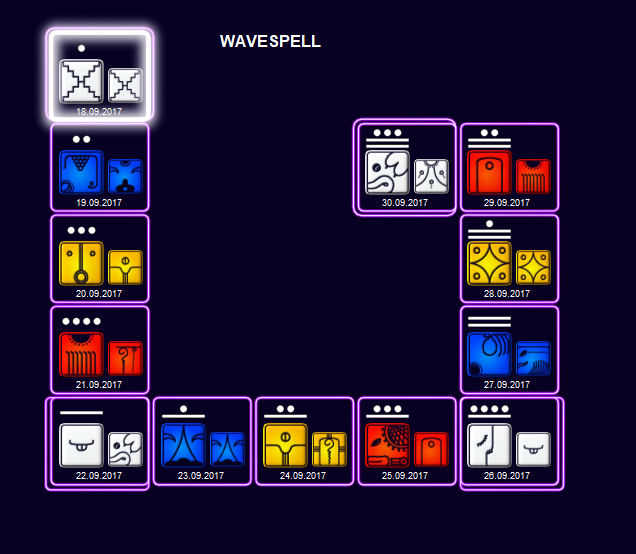 Today we start a new journey of 13 days of the white mirror wavespell. This is the 9th wavespell of our journey through this spin of the Tzolkin. Seal Mirror: Mirror asks for only one thing: the truth. It’ll get rid of decay and will unfold everything to the light. Illusions no longer stand and are put aside. There is only one goal: As Above, So Below. In other words: to reflect the cosmic order upon the Earth. Thirteen days to discriminate truth from illusion and see what the world is trying to tell us. If we stand in front of a mirror, we see our image reflected in it. In the same way, our outer world is a reflection of our inner world. 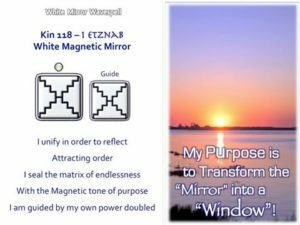 Instead of expecting other people or circumstances to be different, the Wavespell of the White Mirror invites us to connect with our feelings, beliefs and value system in order to make the necessary changes to recover balance, wellbeing and peace of mind. True transformation always starts from within! Mirror is the power of perfection. It is the Tzolkin itself, containing a perfect order of numbers, which is a reflection of the order of the universe. It is a mirror behind a mirror; it is reality behind reality. It is mirror that catches all the rays, subsequently reflecting it to the world as mirror image. What do you send out and what do you receive? Mirror mercilessly reflects the truth; it will get rid of decay and will reveal everything to the light. Illusions can no longer be held onto and are put aside to reflect the cosmic order upon the Earth. Moon 2, Day 27 – When you can no longer recognize yourself, then you have fulfilled the divine command of transcendence and ascension. Kin 118 – Precept 14 – Yoga is the primary tool to build the foundation of the inner temple, which penetrates through the profane so you can realize your innate cosmic identity. White Mirror Qualities: Reflecting others back to themselves, endlessness, shattering truth, clarifier, spiritual warriorship, discrimination, timelessness, clarity, hall of mirrors, sword of truth, facing shadow, integration of paradox..
White Mirror represents the Hall of Mirrors, where you can face your own reflection and see the truth about yourself. As a mirror, White Mirror merely reflects what is, whether truth, beauty of illusion. Here you can face unfinished business, the dissonance of difficulties, or charged issues that would keep you from the full expression of your Divinity. 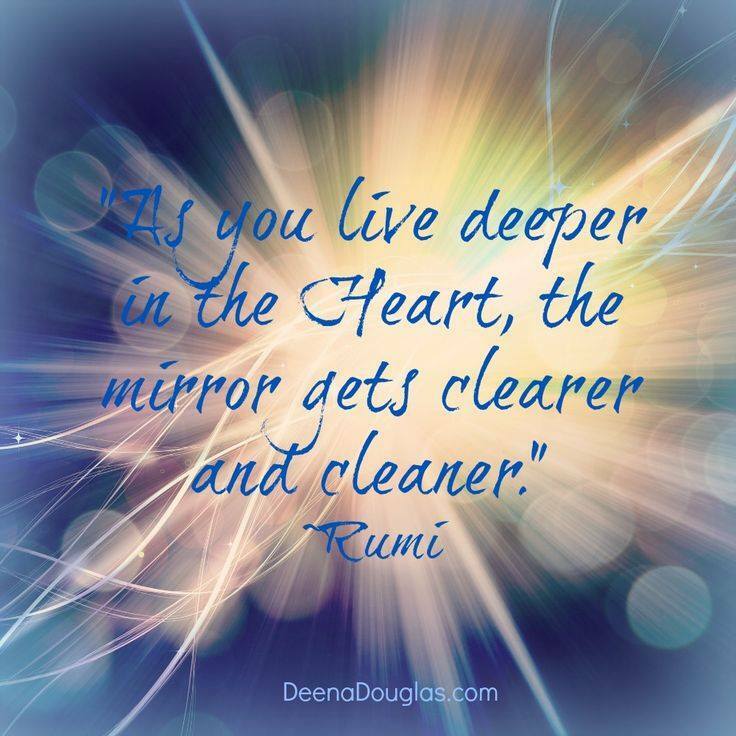 Become aware of any illusions or distortions within yourself; your clarity of perception will transform them. Take a moment to see yourself as you actually are, shadow and all, freed from the maz of mental illusion. You are being given the gift of insight! Use the world and other people as mirrors for your discovery process. Experiment with letting go or taking the other’s viewpoint. Step into the other side of the mirror. Use the sword of discernment to cut away judgement of self and others. In the Hall of Mirrors there is no good or bad, no right or wrong – there is only the reflection of what is. As you learn to see yourself, you begin to see your emotional reactions as signs indicating where to focus your awareness for growth. White Mirror can represent either the trap in the hall of mirrors, or the key that turns the mirror into windows. In using White Mirror as the key, you can discover the gifts of integration within your shadows. The aspects of self that you consider weaknesses, flaws, and problems are actually allies. Through your desire to be whole, a bright spotlight shines on the very areas that you usually try to hide. If these shadow places are worked with, transformed and honored, the illlusion of mirrors is transmuted into windows. Then you can walk through the mirror into the greater reality. When you can no longer recognize yourself, then you have fulfilled the divine command of transcendence and ascension.